The Šibenik Riviera is one of the true gems of Northern Dalmatia, mainly because of the national parks, cultural and historical monuments, and large number of small islands. 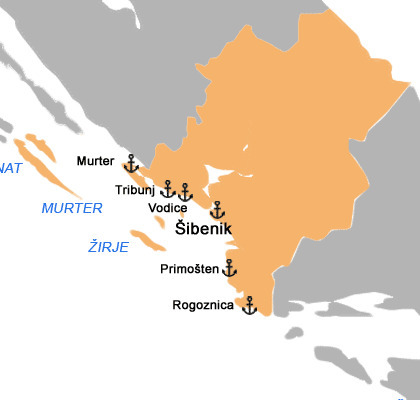 The administration, political and cultural center of this region is Šibenik. The most famous group of small islands, called Kornati, known for their strange shapes, is situated in this region. There are also two national parks, Kornati and Krka, which can be visited even by sea. Primošte, the pitoresque little town is located on a small hill island that is called "Suha Punta" meaning that there is a long period of dry weather. This island is connected to the shore by a bridge, 5 centuries ago, by its inhabitants, so they could go and work on their fields. This part of Croatia offers many possibilities to enjoy, from the nature, cultural customs, to the rich gastronomy offer. One day trips are organized regularly to visit NP Krka, NP Kornati, NP Paklenica, NP Plitvice Lakes, PP Lake Vrana, and the island of Zlarin, bu also the etno village Dalmati. Rogoznica becomes more and more recognizable as a tourist destination. Peninsula Raduča is famous for its sandy beaches with cristal clear sea that attracts tourists from all over the world. One of bigger towns on the island of Murter is small town Murter, about 30 km away from Šibenik, connected to the shore by bridge. In Murter there is famous marina Hramina with 400 wet and 250 dry mooring places. The island of Žirje is known for its fishing tradition, and is connected to Šibenik through the island of Kaprije. Another island, known for its sandy beaches, natural beauty and pleasant hospitality is the island of Zlarin. It is separated from the mainland by the Šibenik Channel, and the main characteristic is that no cars are allowed on this island, so that you can enjoy the beauty and the peace that this island offers.